SpaceX embroidered mission patches like those packed aboard their first attempt at flying the company’s Dragon capsule to the International Space Station. This story was updated on May 19 at 5:32 a.m. ET. The first U.S. commercial spacecraft to attempt to visit the International Space Station, SpaceX's Dragon, will launch into orbit filled with cargo — and something a bit extra — bound for the orbiting outpost. The inaugural payload weighs about 1,200 pounds (544 kilograms) and is mostly comprised of food for the station's crew, student experiments, and storage bags, but the capsule's compliment also includes a stash of space souvenirs commemorating the history-making mission. SpaceX's second test flight of its unmanned cargo craft, which is now set for Tuesday (May 22) after a launch abort earlier today, will need to clear a series of approach and maneuvering tests before NASA approves it moving close enough to the station for the crew to grab hold and berth it using the outpost's robotic arm. As released by NASA and SpaceX, the cargo manifest for the COTS-2 mission includes a line item described only as the "Official Flight Kit" or OFK. The term dates back to the last of the Apollo moon landings in the 1970s and was used throughout the 30-year space shuttle program. Simply put, the OFK is a memento-packed pouch carrying the mission's "official" flown-in-space souvenirs. The COTS 2 Official Flight Kit manifest, as shared with collectSPACE.com, is more concise than previous space shuttle versions, which could go on for pages with several hundred different categories of souvenirs inventoried. The Dragon OFK has just six entries, but comprises more than 12,000 mementos onboard. The OFK includes: 2,000 lapel pins that are in the shape of the space station; 2,900 patches, 4,000 decals and 750 lapel pins with the NASA COTS 2 emblem; 2,500 SpaceX mission patches; and one copper medallion. The manifest provided no additional details about the odd memento out, the copper coin. The OFK items will make a round trip on board the Dragon capsule, which is the only station-visiting spacecraft other than Russia's manned Soyuz that returns to Earth intact. The SpaceX COTS 2 vehicle is expected to splashdown off the coast of San Francisco by the end of May. Once retrieved after the flight, the OFK souvenirs will be distributed to NASA and SpaceX team members to thank them for their work making the mission a success. SpaceX has a $1.6 billion contract with NASA to provide 12 Dragon cargo ship flights to the space station, not counting this test flight. NASA is counting on private spacecraft like Dragon and others under development to provide robotic supply deliveries and, eventually, crew flights to and from the space station now that the space shuttle fleet is retired. 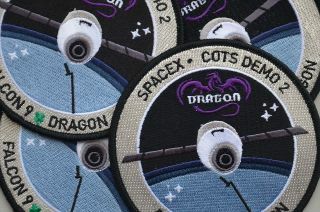 The two different embroidered emblems aboard the Dragon represent SpaceX and NASA. The space agency's oval logo depicts a capsule, although not necessarily the Dragon, launching from Earth toward and past a silhouetted space station. The blue, black and gold insignia identifies the flight as "SpaceX C2+" referring to the mission's attempt to achieve both rendezvous and berthing, separate goals that were originally set by NASA for two test flights. The SpaceX COTS 2 flight patch prominently features the company's capsule, orbiting above the Earth, approaching the space station's outstretched arm (the station itself is not included). In addition to SpaceX's Dragon logo, the gray, blue and black patch includes a green four-leaf clover — a symbol that has been reproduced on most, if not all of the SpaceX flight and mission emblems. "For luck," a SpaceX spokesperson said of the symbol. Click through to collectSPACE.com for to see NASA’s emblem for SpaceX’s history-making mission to the International Space Station.